The CUNY Institute for Sustainable Cities invites you to a panel discussion on food and farming in metropolitan areas, featuring guests from the New York Region and Melbourne, Australia. 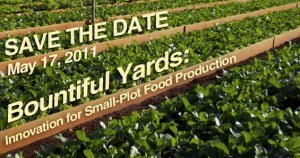 Over the past few years, urban agriculture has received a growing amount of attention. From vertical farms to rooftop greenhouses, academics, entrepreneurs and concerned citizens have been developing innovative ideas for producing food without the acres of land necessary with traditional farming. However, some people are finding inspiration and innovation even closer to home by converting their yards into food-producing spaces. This small-scale farming has the potential to impact the metropolitan landscape, even in dense environments like New York City. A recent study conducted by the CUNY Institute for Sustainable Cities (CISC) and Sustainable Yards found that there are over 52,000 acres of private yard space within New York City’s five boroughs. When extended to the New York metropolitan region, the acreage grows exponentially. On May 17th, CISC will be hosting a panel discussion to examine the issue of food and farming in metropolitan regions, both in U.S. and Australia. The discussion will examine new models for small-scale farming, and their potential role in transforming the metropolitan region and the food system. This event is free and open to the public. Please email ahanso@hunter.cuny.edu to RSVP.